We've been so mesmerized by the impending train wreck that is BlackBerry lately that we'd almost forgotten it makes smartphones. Thankfully, we have a reminder today in the form of a quick video claiming to show off the BlackBerry Z30 (you remember that, don't you?) as it's flipped, swiped and bandied about. This seems to be a fully functioning version of the rumored BlackBerry 10 device. 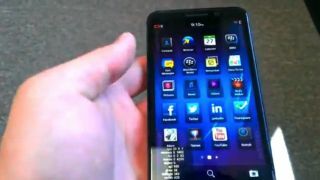 The user shows off its front and back, then activates the phone and takes us on a short tour of its UI. A sticker on the rear tells of the device's evaluation unit status, and interestingly it reads "Property of Research In Motion Limited." RIM changed its name to BlackBerry in January, however it appears some properties, such as this website, still use the old RIM moniker. It feels like it's been awhile since we last heard about the Z30, though in reality the handset made another film appearance earlier this month (that video was subsequently pulled). In that time, we've learned BlackBerry is open to the idea of being bought, among other "strategic alternatives" to survival. On Aug. 27, a report from the Wall Street Journal claimed BlackBerry could spin BlackBerry Messenger, or BBM, into a subsidiary. It's before this backdrop that the Z30 could be released. The device is rumored to square up with a 5-inch AMOLED screen (larger than the Z10's 4.2-inch display), house a dual-core Snapdragon S4 processor and 2GB of RAM. It may have 16GB of storage, an 8MP rear camera and run BlackBerry 10.2. As you can see in the video and other leaks have attested to, the Z30 may have five rows of icons instead of the Z10's four. When will we see the device? Only BlackBerry knows, but it has a lot on its plate right now, so we'll give it a few. BlackBerry, BlackBerry - why release a new phone running BB7?